There are many great love stories out there: Romeo and Juliet, Rose and Jack, Mr. Darcy and Elizabeth. However, there are none so great as the love story between pizza and beer. This pairing is not only perfect, but it’s also unbeatable. It’s a great way to bring together friends and family as well as make you feel warm and fuzzy on the inside. There’s nothing like biting into a hot slice of pizza and washing it down with a cool beer… the mere thought of it is making our mouths salivate. Pizza is a delicious option any time of the day; however, when you add in beer, you’re taking this relationship to a whole other level. Beer can bring out the flavor of pizza and vice versa. 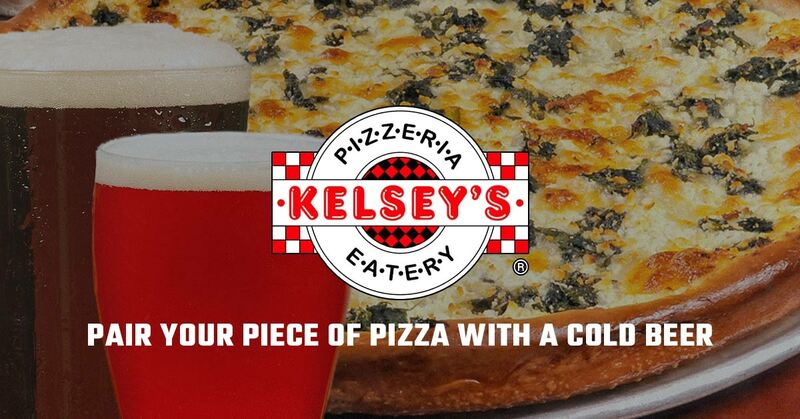 If your stomach is prepared to enjoy some tasty pizza, then check out Kelsey’s in Titusville. We have a wide selection of pizza and beer that will send your tastebuds into a state of satisfaction. Perfecting the pairing of pizza and beer is an art and at Kelsey’s, we have it down pat. When it comes to mushroom and spinach, we highly recommend a stout. Now, mushroom and spinach is good always, but when you have that stout paired with it, you’ll love the impact of flavor. You can enjoy a milk, chocolate, or you can go dry with a porter or a stout. This combination is earthy due to the veggies with a hint of sweet or dry when paired with the stout. With Hawaiian, you can enjoy a golden ale or a fruity one. It’s up to you to decide what direction you’d like to go in. The fruity flavor will bring out the sweetness of the pineapple and the acidic taste of the tomato. The ham will step in to add some salty seasoning. On the other hand, you can enjoy consuming a golden ale to add some lightness to this meal and play off of the sweet and salty tastes. Pepperoni is a classic and should be brought out with an IPA. IPAs tend to be a bit more bitter, which is why it can really amplify the salty meat flavor of the pepperoni. This combination adds a bit more oomph to this traditional pizza. The hops of the IPA are also a great bonus since it tends to have a higher alcohol content than other beers. Florida can sometimes feel like it’s perpetually stuck in summer, especially now that we’re in the midsts of July. A summer Kölsch is a great way to stave off that heat and enhance the taste of veggies on a slice of pizza. The cool, refreshing tastes of a Kölsch will help to bring the veggies into a delicious culmination as you consume this combination. These tastes play off of each other keeping your meal delicate while still being filling. The classic cheese pizza can be a bit more plain for some people, but when you add the American pale ale, you’ll have some more bite in your meal. The classic cheese pizza needs a classic American beer to stand up to and balance it out. While a pale ale can be a bit pungent, it’s needed to cut through that ooey-gooey cheesiness. Are you ready to grab a slice of beer and crack open a nice cold beer? Stop by Kelsey’s and enjoy this delicious pairing.